Sponsor Full Page Ad For H.O.W. - Our beloved Prophet Muhammad (s.a.a.w.s.) has said, "The STOMACH is the house of ILLNESS, and abstinence is the most important medicine. The cause of every illness is poor digestion." BE A HELPER NOW! Help The H.O.W. 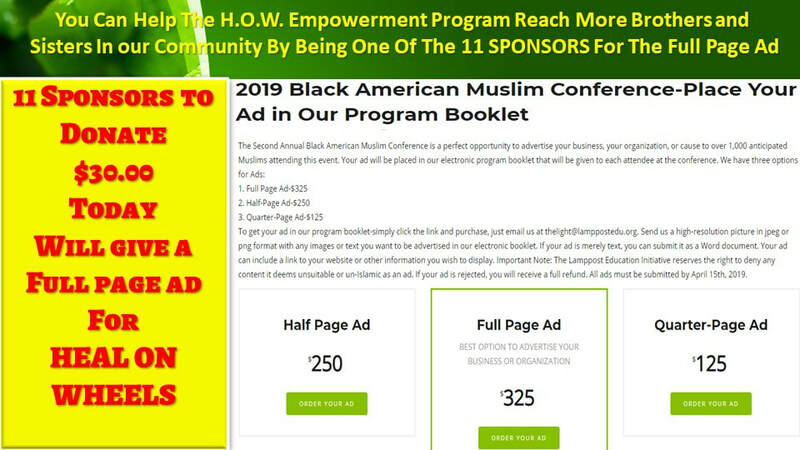 Empowerment Program Reach More Brothers and Sisters In Our Community by Being a SPONSOR or One of the 11 SPONSORS For A Full Page Ad.